In 1924 Achron toured Palestine, performing widely and transcribing traditional oriental Jewish melodies which influenced the works he composed in the USA, where he moved in 1925 (he became an American citizen in 1930), following his brother Isidor, a pianist-composer who had settled there in 1922 as accompanist to Heifetz. He settled first in New York, where he composed his Violin Concerto No 1 (1926), which uses a Yemenite song, as well as providing incidental music for the thriving Yiddish theatre. This included both the masterly Golem suite, introduced by Fritz Reiner at the 1932 Venice ISCM, and music for a 1929 production of Sholem Aleichem’s Stempenyu. The latter had been originally composed in 1918 for the Petrograd Jewish Chamber Theatre, and in 1930, following the New York production, was arranged by the composer as a suite for violin and piano. Stempenyu, originally a novel and later adapted by its author as a play titled Jewish Daughters, relates the story of a klezmer fiddler in a small Jewish village (or ‘shtetl’) in Russia, whose virtuosity attracts the attentions of a young (married) woman. The play is full of realistic dialect, complemented by Achron’s use of traditional klezmer dances. The three pieces of the Stempenyu Suite show Achron’s creative response to the klezmer folk tradition, transforming simple melodies through artful harmonies and textures. Stempenyu plays introduces the hero’s fervent style through a richly eloquent tune, etched over gentle chords, and repeated an octave higher with ornamentation that recalls the vocal improvisation of a synagogue cantor, yet coloured with modal harmony. Scher and Freilachs are lively dances (‘freylach’ is the Yiddish for ‘happy’). In Scher Achron retains the folkish quality of the melody, especially its traditional modal cadence and simple accompaniment. The repeat of the initial phrase is followed by a second phrase which reaches ever higher, over a newly flowing piano texture. The final return of the initial phrase is freshly garbed, again at a higher octave, with polytonal harmonies and bell-like harmonics. The Suite concludes with the zestful, highly syncopated Freilachs, which appears to convey Stempenyu’s almost hysterical wizardy. 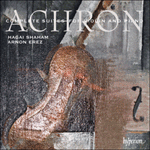 Achron exploits some violinistic resources like pizzicato strumming at the start, and the music develops into an increasingly energetic dance, enlivened by a recurrent, leaping motif. Once again a repeat of the opening an octave higher leads to a frenetic coda. En 1924, Achron fait une tournée en Palestine; il joue beaucoup et transcrit des mélodies juives orientales traditionnelles qui influenceront les œuvres qu’il composera aux États-Unis, où il s’installe en 1925 (il obtiendra la nationalité américaine en 1930), à la suite de son frère Isidor, pianiste compositeur qui s’y était fixé en 1922 comme accompagnateur de Heifetz. Il s’établit tout d’abord à New York, où il compose son Concerto pour violon nº 1 (1926), qui utilise une chanson yéménite. Il écrit aussi de la musique de scène pour le théâtre yiddish florissant, notamment la suite magistrale Golem, présentée par Fritz Reiner à la SIMC à Venise, en 1932, et de la musique pour une production de Stempenyu de Sholem Aleichem de 1929. À l’origine, cette dernière a été composée en 1918 pour le Théâtre de chambre juif de Pétrograd et, en 1930, dans la foulée de la production new-yorkaise, elle est arrangée par le compositeur en une suite pour violon et piano. Stempenyu, à l’origine un roman que son auteur a adapté plus tard en pièce de théâtre intitulée Jewish Daughters, raconte l’histoire d’un violoniste klezmer dans un petit village juif (ou «shtetl») en Russie, dont la virtuosité attire l’attention d’une jeune femme (mariée). La pièce regorge de dialecte réaliste, que complète l’usage que fait Achron de danses traditionnelles klezmer. Les trois pièces de la Stempenyu Suite constituent la réponse créatrice d’Achron à la tradition folklorique klezmer, transformant de simples mélodies par le biais d’harmonies et de textures ingénieuses. Stempenyu plays introduit le style fervent du héros au travers d’un air très éloquent, gravé sur de doux accords et repris à l’octave supérieure avec une ornementation qui rappelle l’improvisation vocale d’un chantre de synagogue, pourtant colorée d’harmonie modale. Scher et Freilachs sont des danses animées («freylach» est le mot yiddish pour «heureux»). Dans Scher, Achron conserve le caractère folklorique de la mélodie, surtout sa cadence modale traditionnelle et son accompagnement simple. La reprise de la phrase initiale est suivie d’une seconde phrase qui va encore plus haut, sur une texture pianistique devenue fluide. Le retour final de la phrase initiale est vêtu de frais, une fois encore à l’octave supérieure, avec des harmonies polytonales et des harmoniques comme celles des cloches. La suite s’achève avec Freilachs plein d’entrain et très syncopé, qui semble traduire la magie presque hystérique de Stempenyu. Achron exploite certaines ressources violonistiques comme le grattement pizzicato au début, et la musique se développe en une danse de plus en plus dynamique, animée par un motif bondissant récurrent. Une fois encore, une reprise du début à l’octave supérieure mène à une coda frénétique. 1924 unternahm Achron eine Reise durch Palästina, gab dabei zahlreiche Konzerte und transkribierte traditionelle orientalische jüdische Melodien, die die in den USA entstandenen Werke beeinflussten: drei Jahre nach seinem Bruder Isidor, einem Pianisten und Komponisten, der sich 1922 in den USA als Klavierbegleiter von Heifetz niedergelassen hatte, zog auch Joseph Achron dorthin und nahm 1930 die amerikanische Staatsbürgerschaft an. Er lebte zunächst in New York, wo er sein Erstes Violinkonzert (1926), in dem ein jemenitisches Lied verarbeitet ist, und auch Begleitmusik für das florierende jiddische Theater komponierte. Darunter befand sich sowohl die meisterhafte Golem-Suite, die Fritz Reiner anlässlich des Festivals der Internationalen Gesellschaft für Neue Musik 1932 in Venedig vorstellte, als auch die Musik für eine Inszenierung von Stempenyu von Sholem Aleichem (1929). Letzteres war ursprünglich für das Jüdische Kammertheater Petrograd im Jahre 1918 entstanden und 1930, nach der New Yorker Inszenierung, arrangierte der Komponist das Werk als Suite für Geige und Klavier. Stempenyu war ursprünglich ein Roman, wurde später von seinem Autor als Drama mit dem Titel Jewish Daughters („Jüdische Töchter“) bearbeitet und erzählt die Geschichte eines Klezmer-Geigers in einem kleinen jüdischen Dorf (bzw. „Schtetl“) in Russland, dessen Virtuosität die Aufmerksamkeit einer jungen (verheirateten) Frau erregt. Im Stück findet realistischer Dialekt viel Verwendung, was durch Achrons Einsatz von traditionellen Klezmer-Tänzen ergänzt wird. Die drei Stücke der Stempenyu-Suite zeigen Achrons kreative Antwort auf die Volkstradition des Klezmer, wobei er schlichte Melodien mit kunstvollen Harmonien und Texturen verwandelt. Stempenyu plays führt den inbrünstigen Stil des Helden mit einer reichhaltigen, eloquenten Melodie ein, die über sanfte Akkorde gesetzt ist und eine Oktave höher mit Verzierungen wiederholt wird, die an die vokalen Improvisationen eines Synagogenkantors erinnern und doch mit modalen Harmonien eingefärbt sind. Scher und Freilachs sind lebhafte Tänze („freylach“ ist Jiddisch für „fröhlich“). In Scher behält Achron eine gewisse Volkstümlichkeit in der Melodik bei, insbesondere was die traditionelle modale Kadenz und die schlichte Begleitung angeht. Auf die Wiederholung der ersten Phrase folgt eine zweite Phrase, die sich über einer von neuem fließenden Klaviertextur immer höher orientiert. Wenn die erste Phrase zum letzten Mal wiederkehrt, erscheint sie in neuer Gestalt, wiederum in einer höheren Oktave und mit polytonalen Harmonien und glockenähnlichem Flageolett. Die Suite endet mit dem mitreißenden, stark synkopierten Freilachs, in dem offenbar Stempenyus fast hysterische Zauberei dargestellt wird. Achron setzt einige geigerische Stilmittel, wie zu Beginn etwa Pizzicato, ein und die Musik entwickelt sich zu einem zunehmend energischen Tanz, der durch ein wiederkehrendes, springendes Motiv belebt wird. Auch hier leitet die Wiederholung des Anfangs um eine Oktave höher in eine frenetische Coda hinein.